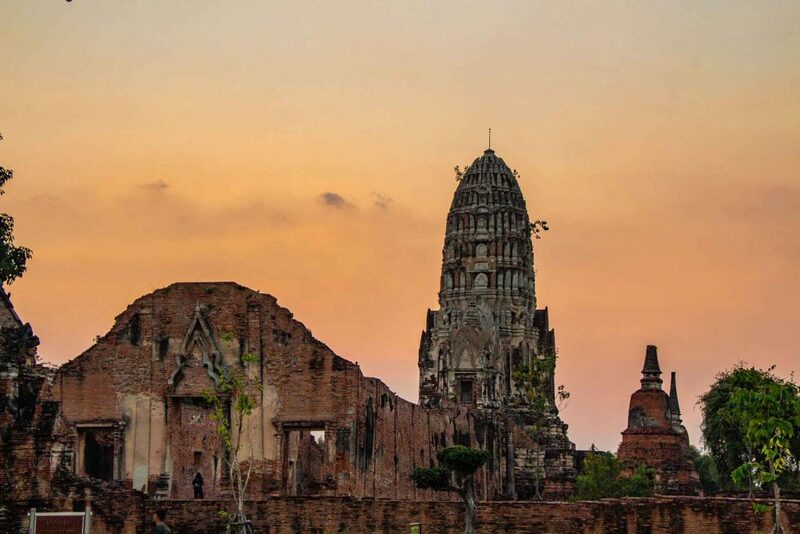 Ayutthaya is the former capital of Siam and was once one of the world’s most important cities. It was nearly destroyed by a Burmese attack in 1767, but we are fortunate that enough temple ruins remain to give us a feel for what this incredible city was like in its prime. We visited here in December with our two kids, aged 3 & 5. We were a little worried about the temples being too boring for them, but they never complained once. Bangkok to Ayutthaya Train: Trains run frequently between the Bangkok Hualamphong train station and Ayutthaya. Tickets for this 1.5 hour journey can be purchased online or at the station. Minivan from Bangkok to Ayutthaya: Multi-person minivans depart from Bangkok to Ayutthaya from Khao San Rd and the north bus station. The journey takes about 1-1.5 hours. Keep in mind, if you have a large bag, you will need to buy a seat for it too. Click here to buy your minivan tickets. Taxi from Bangkok to Ayutthaya: As you’d expect, a Bangkok to Ayutthaya taxi will be your most expensive option, but given it’s in Thailand, it’s still not that expensive. Parent’s traveling with kids will find this the most convenient option and the only one that offers child seats for small kids. Click here to preorder your taxi. 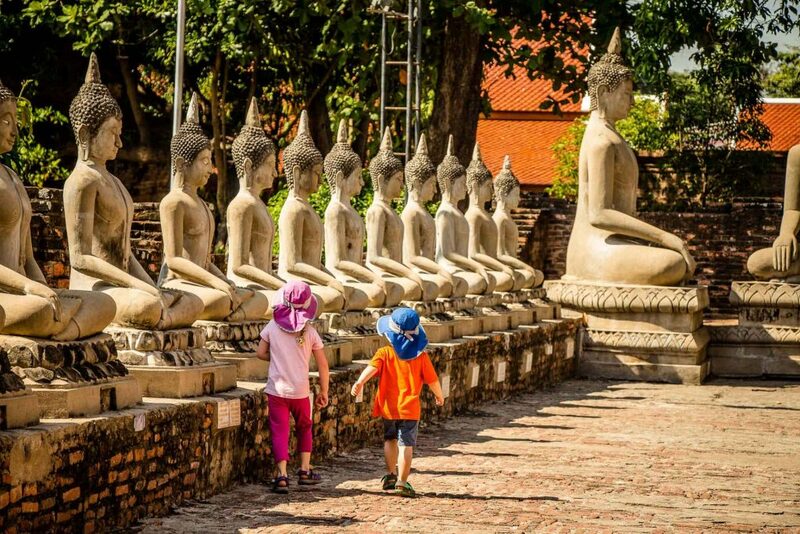 Ayutthaya Tour from Bangkok: If you don’t wish to stay in Ayutthaya, a day trip from Bangkok is a great option. 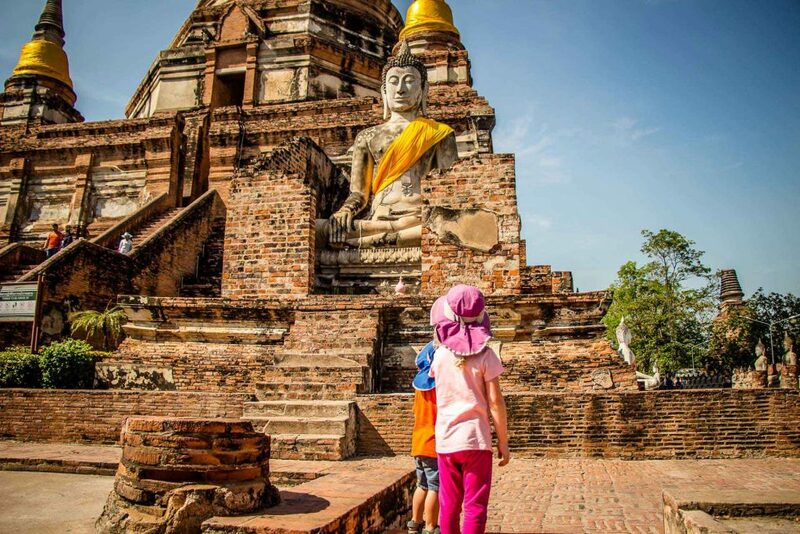 This highly rated day trip to Ayutthaya from Bangkok includes admission to most of the temples we describe below. 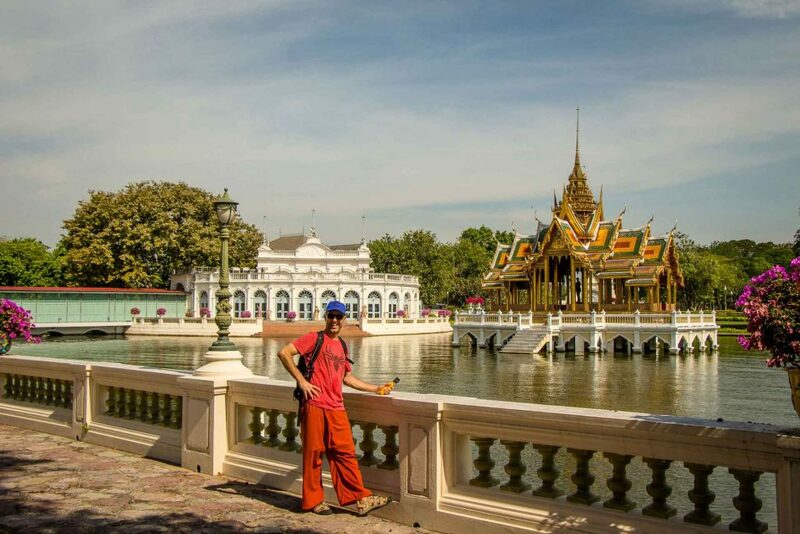 How we got from Kanchanaburi to Ayutthaya: Ayutthaya was our second Thailand destination after hiking, biking and kayaking in Kanchanaburi, so rather than travel from Bangkok, we traveled by taxi from Kanchanaburi to Ayutthaya. We booked our taxi trip using 12Go.asia as it allowed us to easily compare our options, including those who offered child seats. 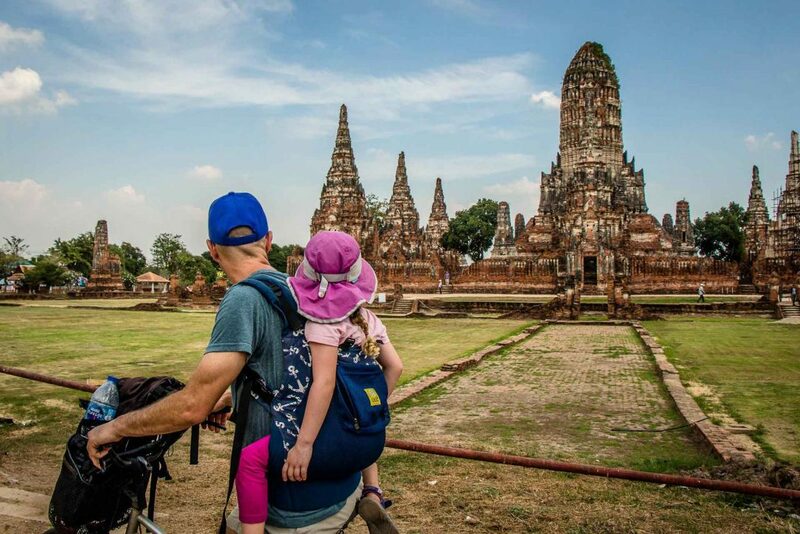 After breakfast, we strapped the kids onto our backs with the carriers we brought from home and hopped onto the complimentary bikes our Airbnb provided and set out to see the off-island Ayutthaya temples. The traffic in Ayutthaya is pretty heavy at times, so we tried to take side streets wherever possible. The great thing about this strategy is that you see so many interesting things, from people’s houses to more obscure temples that may otherwise be missed. There are dedicated bike lanes along most (but not all) of the busy roads in town, which helped reduce the risk a little. 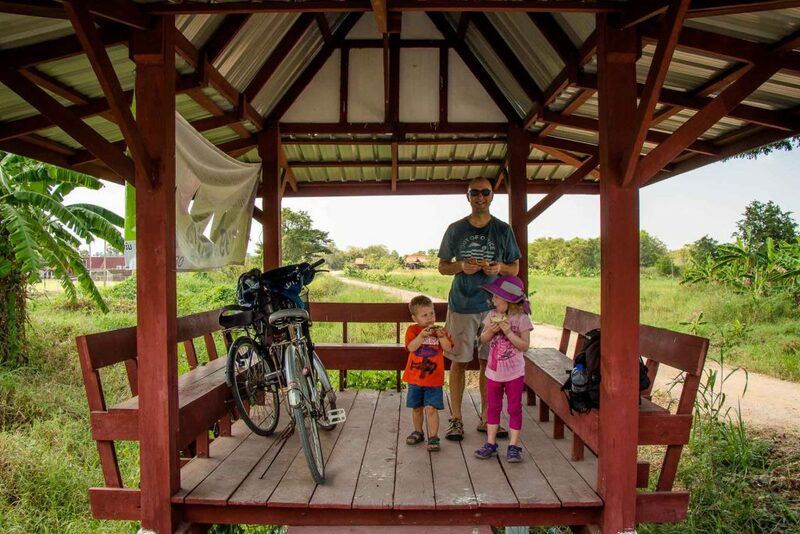 Visiting the off-island temples by bicycle requires you to cross the river a few times along very busy highway bridges. Thankfully, there are pedestrian walkways on the edges of each bridge, so keep your eyes peeled for them. Our first temple visit of the day was Wat Yai Chaya Mongkol, just east of Ayutthaya island. Built in 1357 AD by King U-Thong, this is a very impressive temple with a very tall Chedi at the center, surrounded by hundreds of seated Buddha’s. You are able to climb to the top of the Chedi and walk around an observation deck at the top allowing a panoramic view of this amazing temple. Also, not to be missed at this temple is a very large reclined Buddha wearing a golden robe. From here, we took our bikes along some off-island roads to our next temple. We stopped along the way for a packed lunch at what I’m guessing is a bus stop. At regular intervals along the road are wooden huts, with roofs and benches to sit on. It was a perfect little place to stop and enjoy our lunch. Our second temple of the day was Wat Chai Wattanaram, located just SW of the island. Built in 1630 by King Prasat Thong in memory of his mother, the temple was built in the Khmer style, which was popular at the time. This is a very beautiful temple, with a centerpiece 115 foot (35m) high prang, surrounded by several smaller prangs. 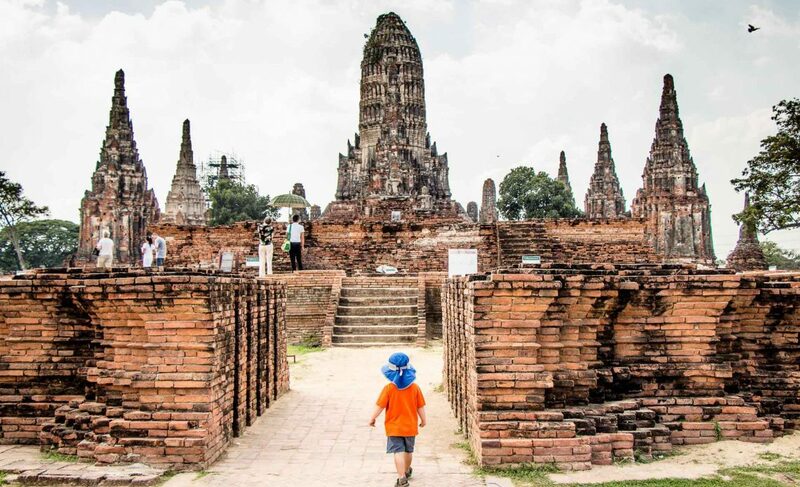 The central platform is surrounded by tall brick walls, with eight Chedi-shaped chapels at regular intervals. 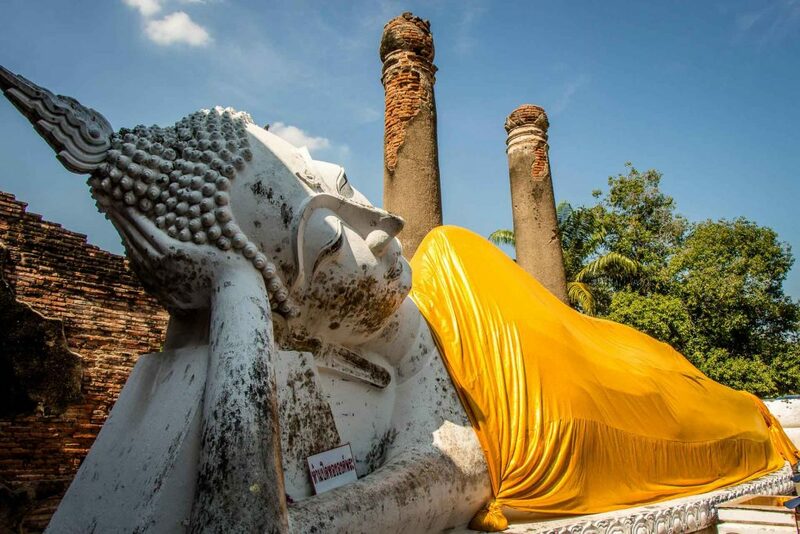 Adding an extra layer of interest to the site are the many beheaded Buddha statues, which happened after Ayutthaya was destroyed by the Burmese in 1767 and the temple was deserted. Afterwards, we went to the Ayutthaya night market on Bang Lan for dinner, but it was a little too busy, a little too exotic and nowhere to sit. There was some stuff the kids may have eaten, but this is a local’s night market, so there was a lot of exotic stuff on offer. We elected not to risk it and went to nearby Malakor Café instead, where we enjoyed a delicious, spicy yellow curry with mussels and pineapple. The kids did really well with their meal as well – Thai omelette for the win! Today we wanted a break from the Ayutthaya ruins, so we took a day-trip to see the Bang Pa-In Palace. Bang Pa-In Palace is a former summer palace of Thai kings. 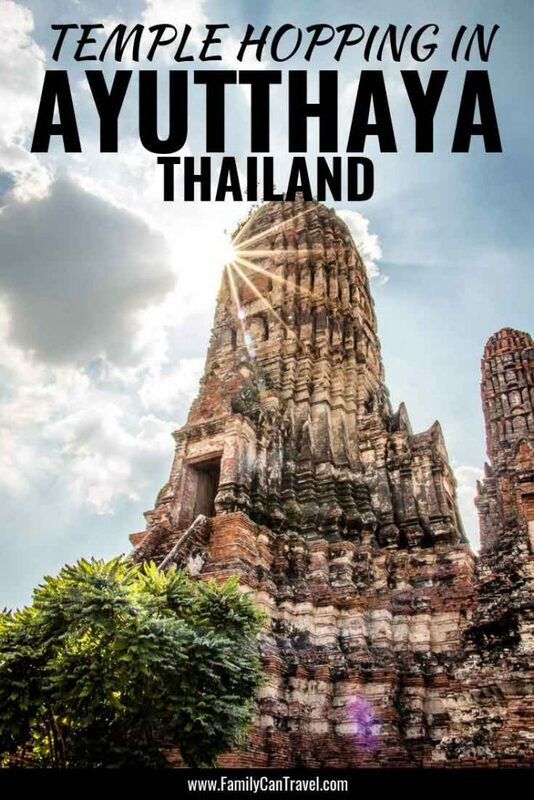 Located roughly 10 miles (17km) south of Ayutthaya, it’s close enough to get there via a taxi or tuk-tuk. 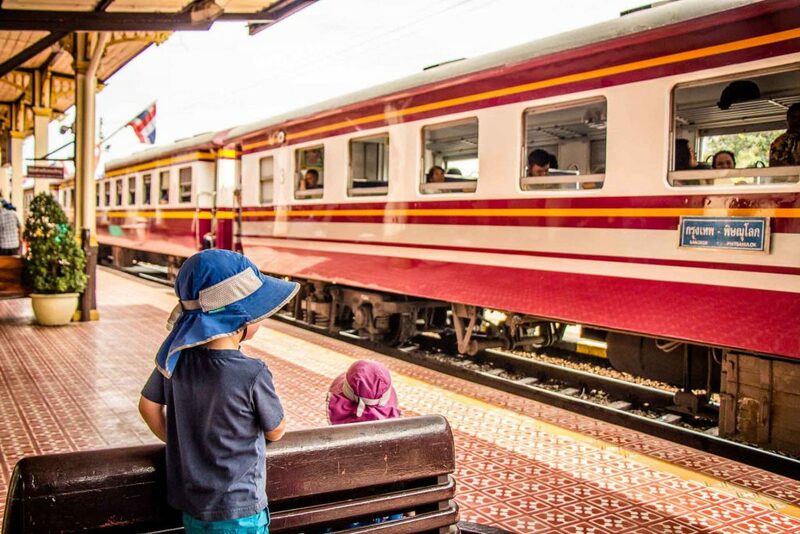 Our Airbnb host offered to arrange a private taxi there and back for 500 baht (~$16USD), but we elected to take the train as the kids really enjoy train rides and we enjoy the adventure of doing it yourself. We had quite a few challenges on this outing, but we persevered and we did it and we had a great adventure along the way! The first surprise of the day was that we had to wait 90 minutes for our train to Bang Pa-In. Our Lonely Planet said there are 16 trains a day on this route, so we must have just missed one. 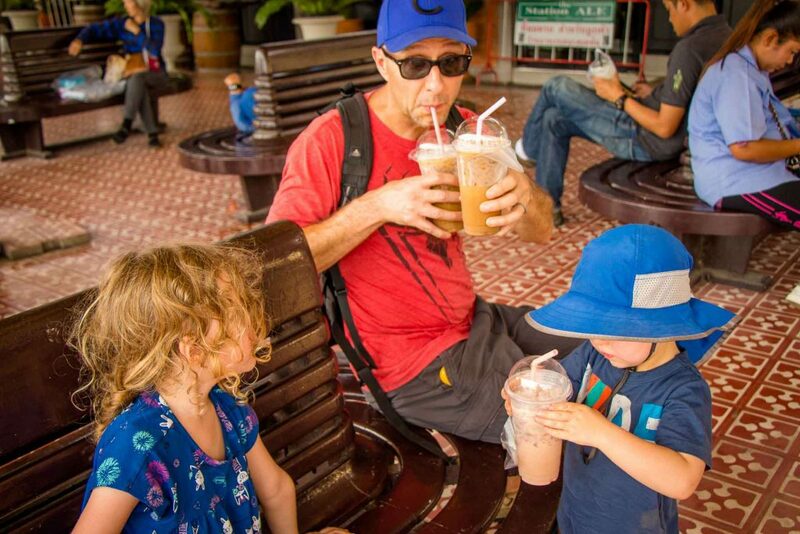 Oh well, the kids had fun running around the train platform, we had an early packed lunch and treated ourselves to some yummy iced coffees (and iced Ovaltine for the kids) from the street market outside the station. The train was a 3rd class train, meaning it was full of locals and open windows with no air conditioning. It was around 91F (33C) outside, but with the shade from the roof and the wind from the windows, it wasn’t too bad at all. 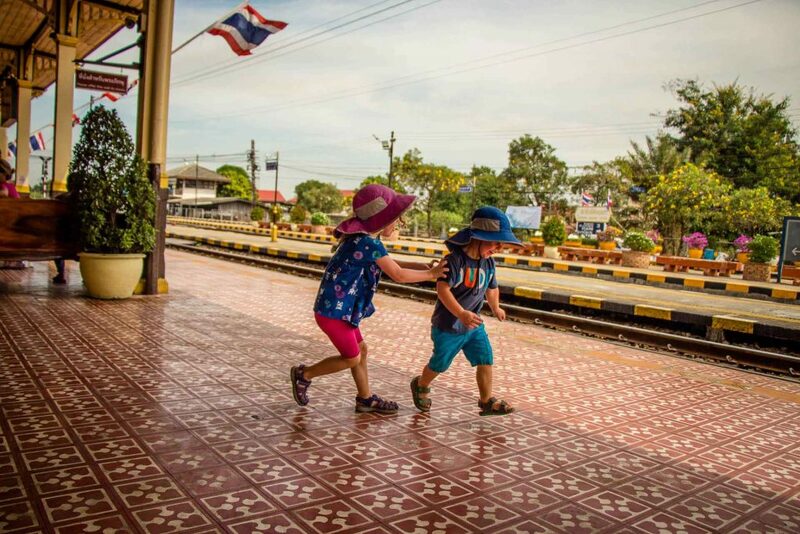 The Thai people have been super friendly towards the kids on our trip and the train rides were no exception. With a choice of looking out the window or at the cute little Canadian kids, most of the locals chose to sit and smile nicely at them. Some were a little bold and tickled the kids (which our daughter liked and our son didn’t). The trains were completely full, but each time we boarded a train, the kind locals got up to move to make room for us to sit together as a family. The tuk-tuk arrived a few minutes later and took us to the Palace, where he agreed to wait to take us back to the station. Surprise #3 was the strict dress code at the Palace. Celine was ok with her capri pants and t-shirt, the kids were not subject to a dress code, but I was wearing shorts above the knee. I was forced to go back out and rent a pair of full length pants for 50 baht (~$1.60USD). I picked a bright orange pair of pants to make the kids laugh. With all the delays earlier in the day, we didn’t have much time until we had to be back for our 2:20 train back to Ayutthaya. But it didn’t matter, we managed to walk through most of the beautiful gardens in under an hour and we felt we saw it all. 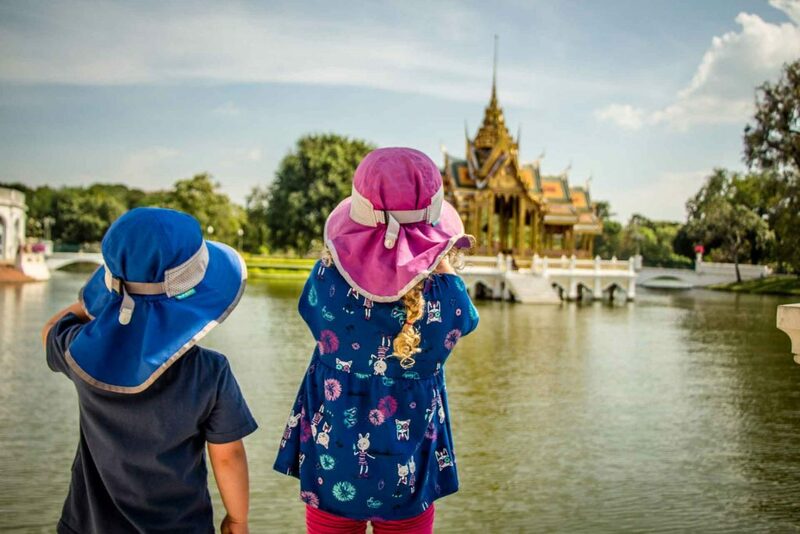 The Bang Pa-In Palace grounds are home to many beautiful buildings, ponds, sculptured shrubs, flower beds, sculptures and more. If you appreciate a fine garden within an opulent setting, you will enjoy a visit here. Surprise #4 was that our train home was 30 minutes delayed, which would have been nice to know as we could have spent more time at the Palace. Upon arriving back in Ayutthaya, all the tuk-tuk drivers were asking double what we paid to get there, but we politely declined all of them until we found someone willing to do it for a fair price. Surprise #5 was the parade we encountered on the tuk-tuk ride back to our Airbnb. 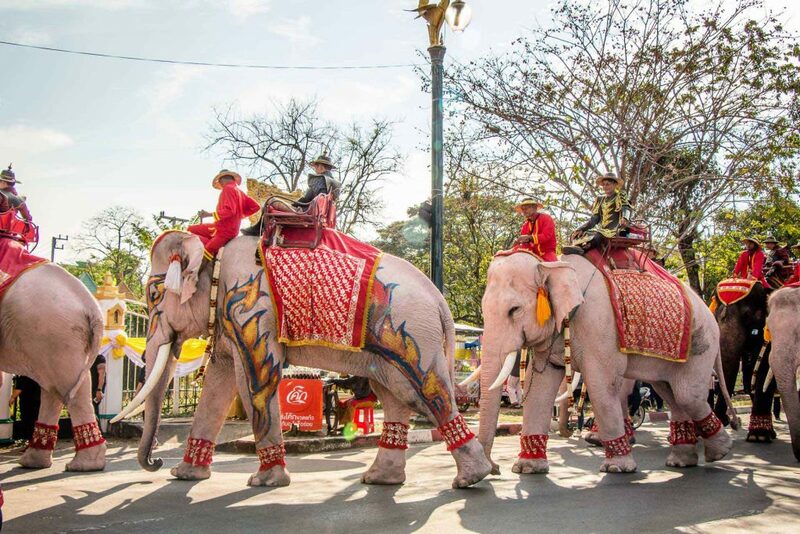 This was the opening day of the Ayutthaya World Heritage Fair and there was a large & very colorful parade blocking the road and we had front row seats. The kids especially enjoyed the painted and beautifully decorated elephants. We could have taken the easy way out and hired a private driver, but it’s the misadventures and surprises along the way that make travel so much fun. We had a great time today! We awoke today to heavy rain. It was a bit surprising given we’ve had nothing but sunshine during our first week in Thailand. December is supposed to be dry season in Thailand, so we hadn’t packed any rain gear and we were unprepared for a day of rain. During a moment where the rain slowed down, I ran to Tesco Express and bought us 4 rain ponchos. 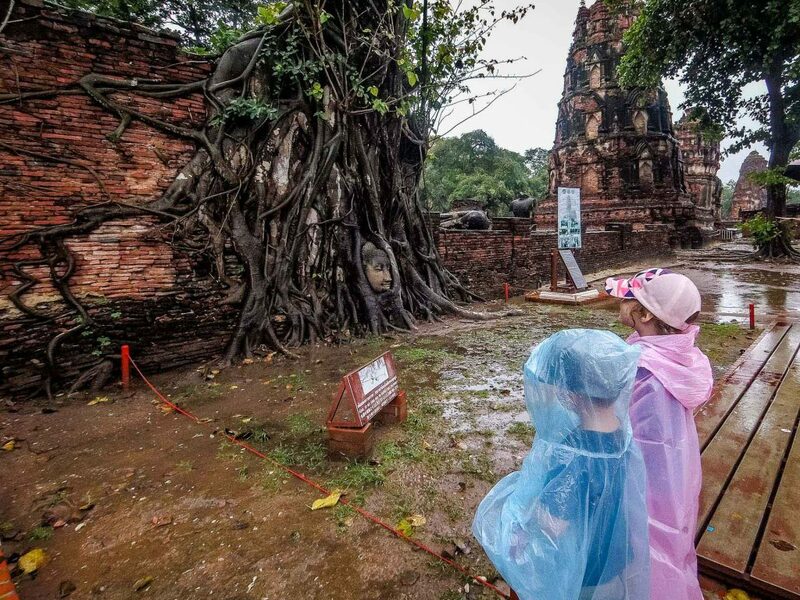 Now that we were dressed properly for the rain, we hopped on our bikes and went to see the top on-island temples Ayutthaya has to offer. 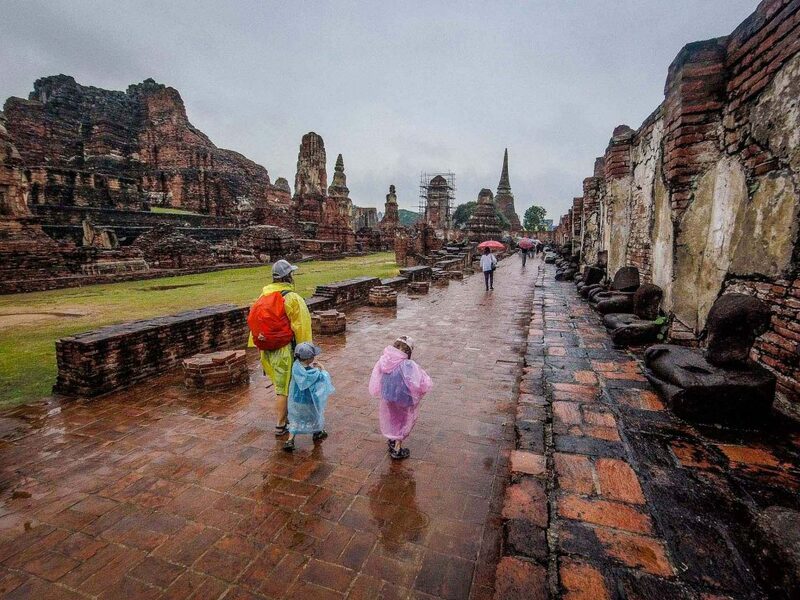 The ponchos worked great and we arrived at Wat Phra Mahathat reasonably dry. 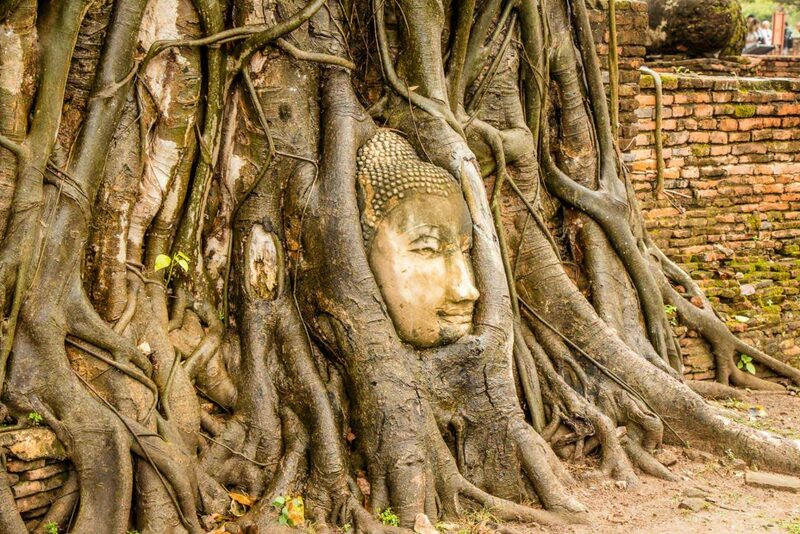 Wat Phra Mahathat is famous for a tree which grew up and around a Buddha head. The temple itself is over 600 years old and is a wonder to walk through. It’s a shame that its majestic 150 foot (46m) high prang collapsed over 100 years ago, but its base still stands in the center of the complex, adding to the ancient feeling of the site. Our next temple was right next door, so we didn’t bother with our bikes and simply walked over. By the time we arrived, the rain had stopped and we took our ponchos off. Wat Ratburana is worth visiting for the intricate details still visible on its main prang. Surrounded by four smaller prangs, the central prang features carvings of mythical creatures, lotus flowers and even original stucco. 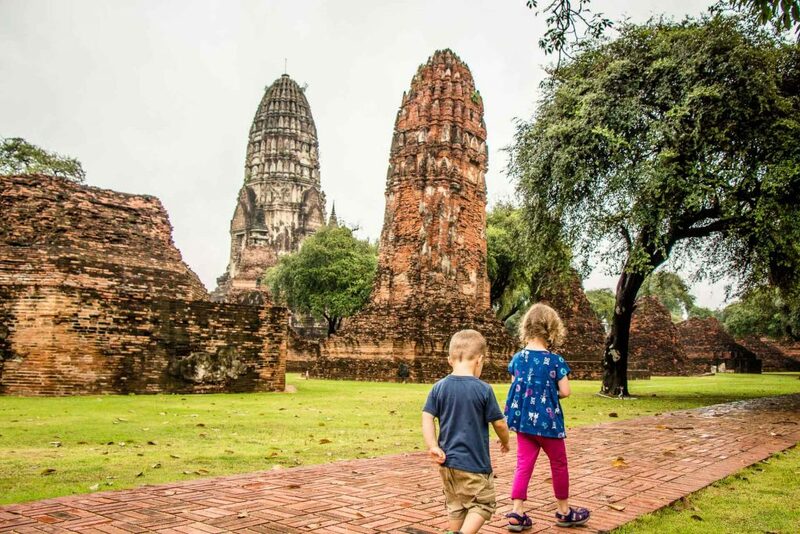 As with most temples in Ayutthaya, it’s reasonably small, so a walk around the site with kids was very enjoyable and well within their attentions spans. Our third and final temple of the day was Wat Phra Si Sanphet. 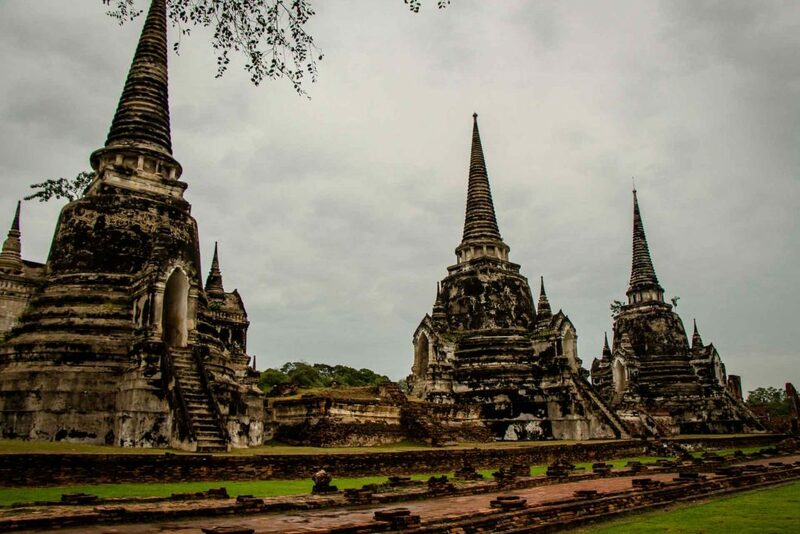 Built in the 1300’s, Wat Phra Si Sanphet was a temple for the royal family and was never home to monks. We found our walk around this temple to be highly enjoyable. The three amazing large, central Chedis are the well-deserved main attraction here, but the surrounding smaller Chedis really added to the charm of the temple. 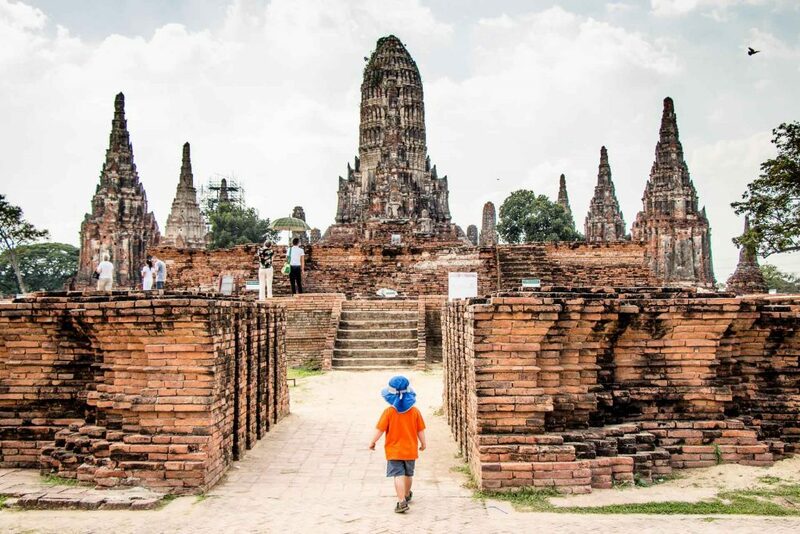 With so many amazing temples in such a small area, Ayutthaya reminded us of a miniature Angkor Wat. 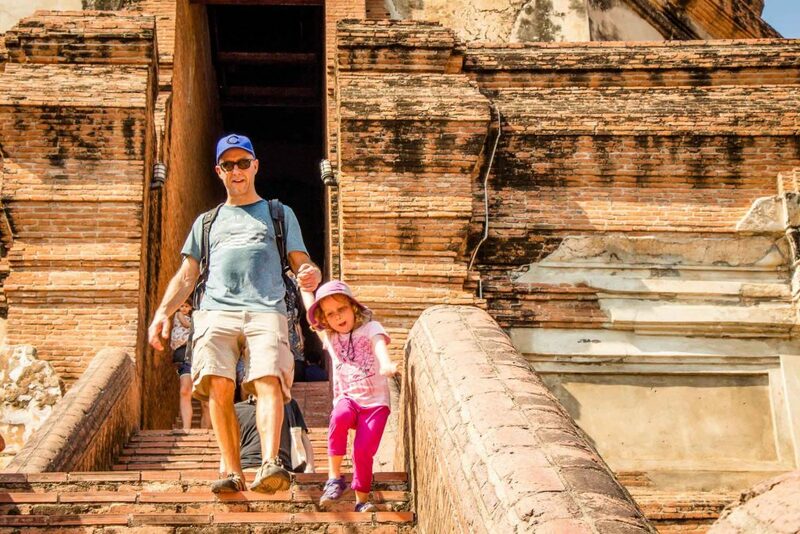 We visited 5 of the best temples in Ayutthaya during our three day visit. The temples were all small enough and full of enough stuff, that the kids never complained once about being bored. We could have done it in two days, but we’re glad we had the extra time to slow down and enjoy the experience. We rented a 3 bedroom villa in the Kamalar Palace Retirement Village. Located in a quiet residential neighborhood away from the tourist zone, we had use of complimentary bikes allowing us to get anywhere on the island quickly. We enjoyed having our own bedrooms and unlimited bottled water, but the kitchen facilities were quite simple. Our kids loved the exotic birds on the property, including talking Myna birds. We had one of our best meals in our whole month in Thailand at their restaurant. Even if you don’t stay here, the fixed course meal is worth a trip out.